The Holy Island of Lindisfarne has been a Christian holy site and pilgrimage center since 635, playing a pivotal role as a cradle of Christianity in Northern England and Southern Scotland. Nature and spirituality are very much linked here through a line of “nature saints,” of which St. Cuthbert — considered by some as England’s first nature conservationist — is best known in the area. The spiritual values of the island are mostly associated with these saints, the places linked with them, and the relationship with the island and its wildlife. 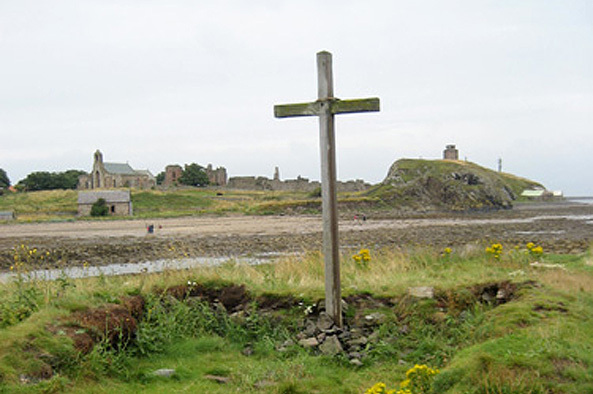 Lindisfarne has a number of active Christian groups and, more recently, has become a node in the revival of Celtic Christianity — an indigenous, if somewhat contested, type of Christianity where the spiritual values of nature are overtly expressed. Recent years have seen an increasing number of pilgrimages, and visitors are now estimated to exceed half a million per year, placing strains on this small community as well as on the island and surrounding coastal habitat, most of which is an official national nature reserve and designated on the Ramsar List of Wetlands of International Importance. The challenge today is to strike the best balance between spiritual, natural, community and economic values and interests; a mechanism to generate an overall shared vision among different interests could ensure that all the island’s values are in balance and its overall integrity is maintained. The Holy Island of Lindisfarne is one of Britain’s foremost Christian sacred natural sites and is the only one where national ecological values overlap with national religious and historical values. The island is located on the northeast coast of England, on the border with Scotland, and is accessible at low tide across sand and mud flats, which carry an ancient pilgrim’s way and a modern causeway. It is surrounded by the 8,750-acre Lindisfarne National Nature Reserve, which protects the island’s sand dunes and the adjacent intertidal habitats. Almost 300 bird species have been recorded in the reserve, and the total wintering wildfowl population, which includes six internationally important species, is estimated at 60,000. Lindisfarne, one of the first Christian monastic communities in England, was founded in 635 by St. Aidan, whose generosity and humility are considered to have established the spiritual pattern of the island. For 240 years it was a center of early Christian learning and missionary endeavor. It is one of a number of holy islands off Britain’s coast and is associated with several saints, including St. Cuthbert, who served as bishop of the island’s monastic community during the late 7th century. St. Cuthbert had a reputation of a close relationship and affinity with nature, attributable to both a Christian nature tradition and pre-Christian Celtic nature spirituality. He was particularly fond of the seabirds and is attributed with establishing one of the first-ever bird protection rules relating to the killing of wildfowl. Desecrated by the first Viking raid on England in 793, the abbey finally moved St. Cuthbert’s relics off the island in 875, and Lindisfarne was largely unoccupied until the reestablishment of a Benedictine priory around 1150. This was destroyed between 1536 and 1541, during the dissolution of the English monasteries by King Henry VIII. This event was part of the founding of the Anglican Church, with the English monarch as its head. The Anglican Church is the oldest church on the island and, in some regards, can be said to be the inheritor of the Lindisfarne tradition. The 12th century parish church, Saint Mary the Virgin, is said to be on the site of the wooden church built by St. Aidan. Another religious community, St. Cuthbert’s Centre, hosts a variety of religious, spiritual and cultural events, including an annual retreat called “Faith and Feathers,” which combines bird watching with spiritual considerations. There is also a Catholic church, and two retreat centers, one of which focuses on Celtic Christianity. The various church groups meet together weekly to coordinate, and Holy Island has a strong ecumenical movement. Lindisfarne has, along with Iona in Scotland, been the node of a revival of a Celtic spirituality. Some argue that there never was an organized “Celtic Church” or a distinctive Celtic spirituality. However, many argue that there was indeed a distinctive form of nature spirituality of the Celts that was incorporated into the early Christian Church as it established in these islands in early medieval times. Based on this, a rich, modern Celtic spirituality revival has developed. Celtic spirituality not only redefines nature as part of a Christian ethic, but also aims to heal the division between mind and matter that occurred during the reformation. While Celtic Christianity has its skeptics, it is clear from its remarkable popularity that it is filling a need for a form of Christianity with a clear concern for the Earth and its ecological community. The main Lindisfarne settlement, with about 150 residents, is a traditional Northumbrian village reliant on fishing and farming but increasingly engaged in tourism, which is now estimated at 70 to 80 percent of the island’s income. While a number of long-established families have deep-rooted cultural ties to the island and unique traditions, the local population has been declining in recent years as people leave to seek jobs elsewhere, and increasing demand from “incomers” has increased house prices such that young people can no longer remain in their community. The local islander community has fears of the island becoming dominated by new religious groups that do not fall into the traditional and familiar churches. Lindisfarne has the potential to bring nature conservation and spiritual values together, infusing the increasingly urgent need for global environmental action with a spiritual dimension. Increasing numbers of visitors, and their attendant vehicles, support the local economy but add significant pressures that may compromise the island’s overall integrity. This rising tourism, along with a growing property economy, is also putting local community values at risk. To meet these challenges, the key players on the island have been taking significant steps, including a greater understanding of the human ecology of the island and an increased level of collective action to ensure that the island maintains its integrity and multiple values into the future. In response to the lack of affordable housing, the islanders established the Holy Island of Lindisfarne Community Development Trust in 1996. The trust established the Lindisfarne Visitor Centre, using the profits from sales for the benefit of the community, including building 11 community houses that are rented to community members who want to stay on the island. In this way, the island community is proactively countering some of the challenges brought about by high property values. Whether the community ownership of only seven percent of the housing stock will be sufficient to ensure community continuity remains to be seen and a higher target might be needed. Reflecting trends including an increasing interest in both nature and spirituality, tourism is now the mainstay of the island’s economy. Visitors include day-trippers, birdwatchers, pilgrims and retreat-goers. The birdwatchers come mostly during spring and autumn, when the migrant birds pass through and the wintering wildfowl are in residence. Pilgrims come primarily over the summer, with a small but increasing number coming by foot. Some of these have used one of the newly established long-distance themed walks, which are not original pilgrim routes but walks based on themes related to Lindisfarne. Bus pilgrimages of 2,000 people in 60 buses are not unusual, and unannounced arrivals can overload the facilities, disrupting local traffic and putting severe strain on car parking. In addition to natural and spiritual values, the island is important for local community and heritage, and also for economic values, but these values are not necessarily balanced. At one level Lindisfarne is a “normal” Northumbrian village, with long-term needs such as employment, affordable housing and schools. These needs to some extent run counter to a high-profile visitor attraction generating high property values. The management of the island itself and surrounding coastal wetlands is distributed among a wide range of entities and institutions, leading to multiple visions for the future of the island. No clear mechanisms have been established to discuss or decide the trade-offs between different visions and development paths. Some of the players are very large national-level government, church or charity organizations that have specialized mandates, bureaucratic tendencies, and remote and relatively inflexible decision-making mechanisms, while other key groups, especially the local community members, have no formalized voice in the decision-making process. The Community Development Trust, however, is widening its remit and gaining experience, and is therefore becoming better able to represent the community with larger institutions on a more equal footing. A process of analysis, reflection and understanding followed by consensus decision-making would appear to be necessary, bringing key players together in a more in-depth way than their current working patterns and communications allow. Decision-making staff need to be engaged in this process and be willing to commit to taking action on joint decisions. The first steps are now being taken toward such a process with the formation of a proposed Holy Island partnership. This is in its very early stages and is not widely known among some of the key players. While a forum is likely to be essential, it may not be sufficient, especially at the start; a consensus-building process may need to be undertaken to engage with a wider group of people than the forum representatives. One approach to consensus building could be a series of facilitated workshops to bring ideas to the table that could be examined in a positive light, generate a shared vision, and develop an agreed work plan. It might be useful to ask questions about the island’s economy: What is it for? How does it work? How big is too big? What is fair? How is it governed? Understanding and building a whole-island economy that answers these questions could be an important effort. Key organizations active on Holy Island should examine how they might serve community cohesion, a community of diverse interests unified by a strong sense of place. Adam, David. Border Lands: The Best of David Adam’s Celtic Vision. Wisconsin: Sheed and Ward, 1991. Bede. An ecclesiastical history of the English People. Edited by Judith McClure and Roger Collins. Oxford World Classics, 1994. Beith, Alan. “Sir Alan Beith launches unique housing venture on Holy Island.” Rt. Hon. Sir Alan Beith MP. Bradley, Ian. Celtic Christianity: Making Myths, Chasing Dreams. New York: Palgrave Macmillan, 1999. Brown, Michelle P. Painted Labyrinth: The World of the Lindisfarne Gospels. The British Library, 2004. Brown, Peter. G. and Garver, Geoffrey. Right Relationship: Building a Whole Earth Economy. San Francisco: Berrett-Koehler Publishers Inc., 2009. Farmer, David Hugh. The Oxford Dictionary of Saints. Oxford University/Clarendon Press, 1978. Leatham, Diana. They Built on Rock: Stories of the Celtic Saints. London: Hodder and Stoughton, 1948. Magnusson, Magnus. Lindisfarne, The Cradle Island. London: Oriel Press, 1984. Meek, Donald. The Quest for Celtic Spirituality. Kincardine, UK: Handsel Press, 2000. Natural England. “Lindisfarne National Nature Reserve.” Natural England. Natural England. Management Plan of Lindisfarne National Nature Reserve. Natural England, 2005. Newell, J.P. 1999. The Book of Creation, An exploration of Celtic Christianity’s celebration of creation and creativity. Paulist Press, New Jersey, USA. St. Mary’s Parish Church — Holy Island. Excerpted from Wild, Robert. “Nature Saint and Holy Island, Ancient Values in a Modern Economy: The Enduring Influence of St. Cuthbert and Lindisfarne, United Kingdom.” In Sacred Natural Sites: Conserving Nature and Culture, edited by Bas Verschuuren, Robert Wild, Jeffrey McNeely and Gonzalo Oviedo, 77-86. London: Earthscan, 2010.